Since I wrote about Christmas in yesterday's post, I figured I would rewind and recap my Thanksgiving weekend today! One of my best friends, Bennett, was visiting and stayed to celebrate Thanksgiving with all of us. Let me tell you, if you have ever wondered if you should adopt a southerner for Thanksgiving, do it! Aside from having my best friend share in the holiday, she brought some seriously delicious southern recipes with her! Our Thanksgivings are always a little unpredictable, since my brother is a vegetarian and I'm gluten free. This year, we added in the fact that it was hot, and ended up with a delicious day of eating both Thanksgiving and non Thanksgiving foods, plus lots of drinking. We ended up doing 5 courses with different wine pairings for each! Pecan Pie, Chocolate Pie, Gluten-Free Chocolate pie! And we were all on eating and drinking duty! That Sunday, we finished off our Thanksgiving weekend by heading down to Miami for the Dolphins vs. Seahawks game! Jealous again of the nice weather! The pies look yummy :) Ahh, looks like yall had SO much fun!! The reason people don't go to Dolphins games is because very few people in South Florida are from South Florida! When all of the northerns come down, they usually stay fans of their hometown teams! It's so sad, especially when you've lived in the area for 10 years!! We have the same problem here in Tampa. The Rays are in the same division as the Red Sox, Yankees, and Oriels. BUT if you go to a Rays game when they are playing the Sox, there will be significantly more Sox fans than Rays fans! Rediculous!! I will never understand why fans just don't support a home town team if they are losing. Trust me, you're preaching to the choir on this one. It's unbelievable that a few losses, or a bad season impacts ticket sales so much! Whoops- end rant ;) You are as beautiful as ever in EVERY ONE of these pictures. I'm serious! Ugh I am a Giants fan too and not a happy one this am. Not fun to stay up late for Monday night football when you lose like that. In your pictures from Thanksgiving day, you look sooo pretty! And I love that shirt you're wearing. Looks like y'all had a great holiday together! A couple years ago when the Pro Bowl was in Miami we went. I feel sad for the Dolphins. Well really all Miami teams except for the Heat. No one ever goes. Can we just talk about how freaking gorgeous you look in every single stinking picture?! Is this serious? That never happens to me. Anywho, looks like you had a blast at the game! 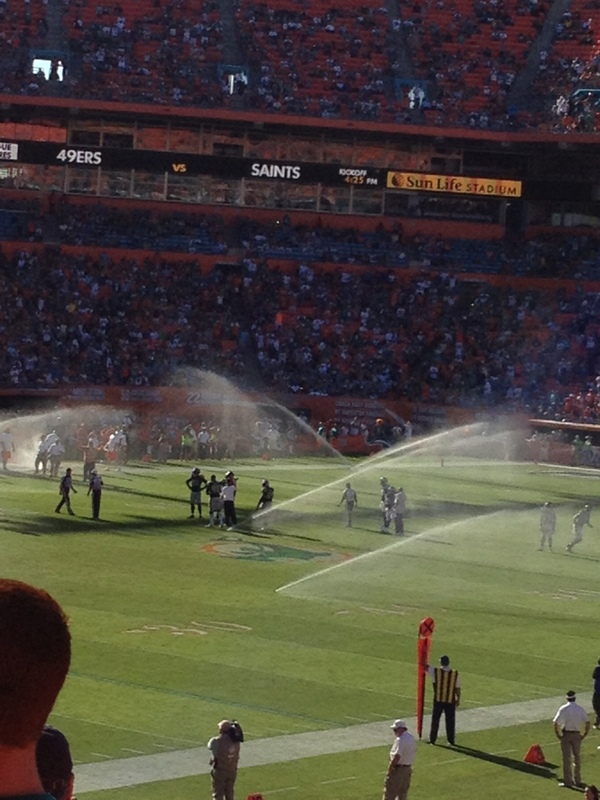 That cracks me up about the sprinklers!! Those desserts look amazing & I adore that cardi- super cute! My boyfriend is a die-hard Dolphoins fan. And while I cheer on the Saints, I can't help but root for Reggie Bush when he makes a play. Boy is fiiiine ;) Hate that he left NO! I can't believe...I rode a bull!